Unethical Mobile Food Properties is hosting a new Food Gathering in Carson. If you read my post on “Boycotting MFP“, there was a mentioning on how they “stole” a GFT’s Kmart lot (aka: South Bay DinDinaGoGo). Well, this is the lot they stole, and they are finally promoting it as a “free” event. The event may be free to the patrons like you, but it was taken away in an unethical manner from a hard working food truck operator. They took the lot from someone who had gone through the local channels. MFP went over the local manager’s head and contacted the “Corporate” office, and Corporate was probably unaware the Carson lot was already being used by someone else. Again, this tactic MFP used was not illegal, but highly unethical. Rather than finding their own lot, they found it easier to take someone else’s successful lot, and claim it as their own. 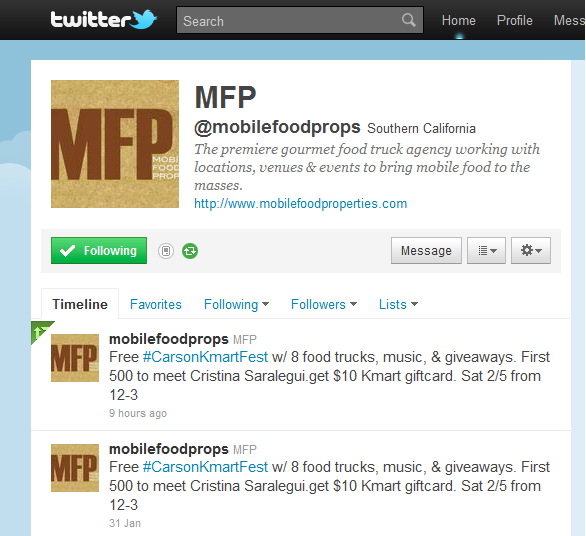 If MFP is going to claim this lot was not stolen, why not use the Kmart lot in Torrance? Or pick a Kmart lot in some other city? Why Carson… the lot that SBDinDinAGoGo used? The 8 food trucks who are participating are still unknown, but I’m sure if you search #CarsonKmartFest you can find out who will be attending this. There’s not even an official flyer, which tells me this was all done rather quickly. If you do attend, please remember that Kmart was not “discovered” by Mobile Food Properties. They stole the land from another Food Truck operator, who worked hard to secure the lot via the local channels. Do you really want to support an Unethical promoter? Even though MFP cleaned house, I find it hard to believe that the head of the organization was in the dark about the shady dealings. If this were “MY” company, I’d want to make a image change, and issue a statement about the positive direction of the company. We have yet to see any statement or acknowledgement about the tainted past of MFP. Remember, you can always visit your favorite food truck outside an MFP event!